WSA (NZ) is a feminist organisation formed to promote radical social change through the medium of women's studies. It is a small, voluntary, non-profit organisation, independent of any institution. We believe that a feminist perspective necessarily acknowledges oppression on the grounds of race, sexuality, class and disability, as well as gender. Māori are the tangata whenua of Aotearoa. We address racism and promote biculturalism in our work and activities as aims of our organisation. 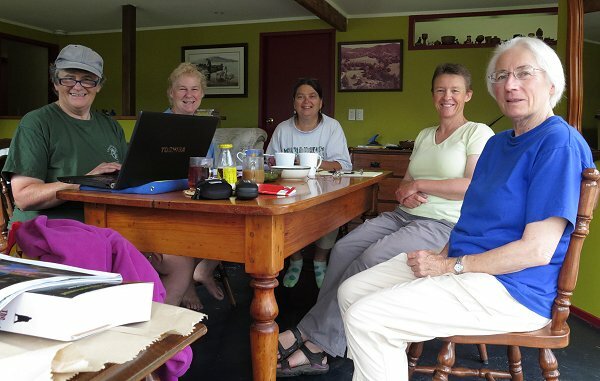 Members of the new Auckland Organising Group on their recent trip up north, working with Ruth Renner on the new website. Convenor, Rachel Simon-Kumar, provides leadership and coordinates the activities of the association. Secretary/Treasurer, (position to be filled), administers Association business, including finances and membership. The Auckland Organising Group of WSA(NZ) is responsible for the running of the Association. Current members include Hilary Lapsley, Alison Kagen, Annie Weir, Sylvia Baynes, Colleen Smith, Laura Ashton and Ruth Busch. Until early 2014 the Association had been run for many years by a Wellington Organising Group. Past convenors of the Association include Ana Gilling, Mary Mowbray, Prue Hyman, Lesley Hall and Claire-Louise McCurdy. To undertake, promote and disseminate research about women, by women from a feminist perspective. To inform and educate women about women in culturally appropriate ways. To encourage the preservation of existing material about women in culturally appropriate ways. To facilitate the establishment of women's studies courses with a feminist perspective. To undertake and promote the publication of material about women. To organise and participate in activities, conferences, seminars and displays in furtherance of the aims of the Association. Read a summary of our 2014 Annual Plan here. Read about 25 years of WSA(NZ) in an article from a recent Women's Studies Journal, a scholarly journal published by our Association since 1984. The Constitution of the Women's Studies Association (NZ) Incorporated may be read in pdf or doc format.